Save money - buy in a bundle with Magic Data. Personalise and enhance your eCommerce site with Magic Data. eCommerce integration for Magic Data including templates for eCommerce blocks, a suite of eCommerce symbols and Magic Data powered discounts and shipping types. 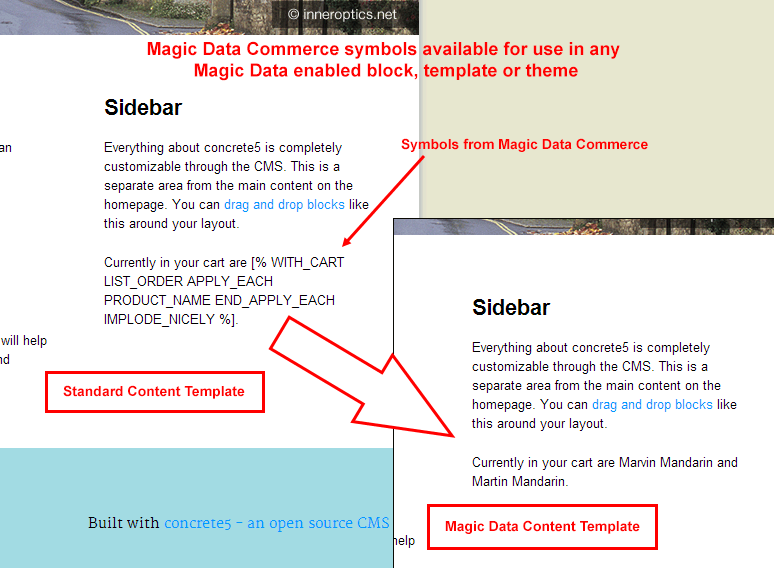 Symbols to integrate product, cart and order information within Magic Data tokens. Magic Data powered shipping type. Additional upselling symbols integrating with Magic Data Commerce are provided by Similar & Recently Purchased Products. 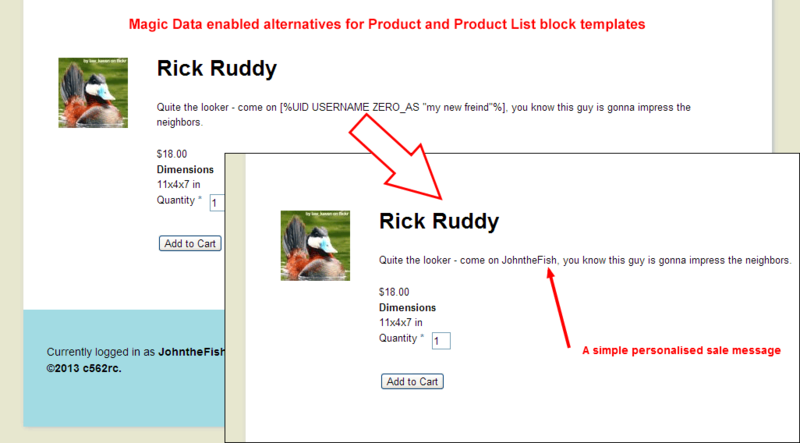 Show product information and attributes anywhere on your site. Show selected cart and order information anywhere on your site. List your most popular products. Extend product information with information pulled from other products. 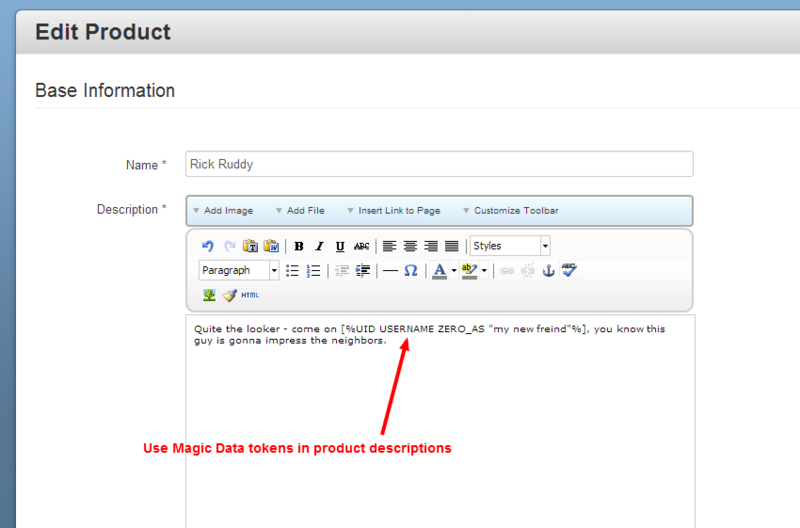 Pull product information into a blog post announcing the product (integrates with ProBlog). Embed a product video within a product description (integrates with the Oembed addon). 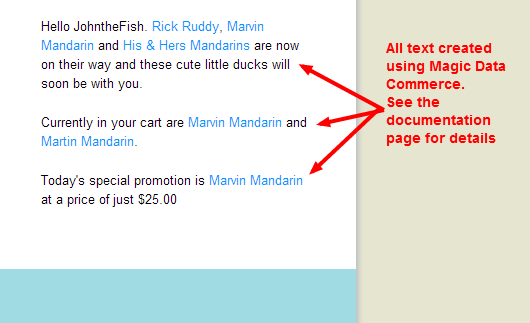 Pull product information directly into Special Instructions. Welcome users with a personalised update on their order status. Upsell from anywhere on your site (integrates with Similar & Recently Purchased Products). Set up discount and shipping rules as trivial, obscure or complex as you like using Magic Data expressions. These are just a few ideas. Get creative by combining the provided symbols and you can achieve some great eCommerce customisation without any php. The documentation includes some worked examples to help fuel your imagination and a growing section of worked examples can be found on c5magic.co.uk. But it doesn't stop there. The easy plugin system for extending Magic Data means that if the bundled symbols are not enough you can apply a little php to create symbols specific to your requirements. The possibilities for customising your web shop are virtually limitless. To use Magic Data Commerce, as a minimum you will also need the paid addons Magic Data and eCommerce and the free addons Magic Data Templates and Magic Data Symbols.